DIY this Rose Petals and Green Tea Gift , it's perfect for the upcoming Galentine's Day. Are you familiar with Galentine's Day? No…I didn't just make a typo…I'm talking about Galentine's Day…with a ‘G'. I know that Hallmark gets knocked for creating holidays, but this is a straight-up made-up holiday that I can totally get behind. If you don't watch Parks and Rec on TV then you may not be familiar with this, originally fictitious, holiday; but it is a holiday that the character Leslie Knopes invented to celebrate her gal friends. So, in addition to frittatas and quiches and fruit salad to celebrate your gals, wouldn't it be lovely to bring your gals a little token of love and appreciation? 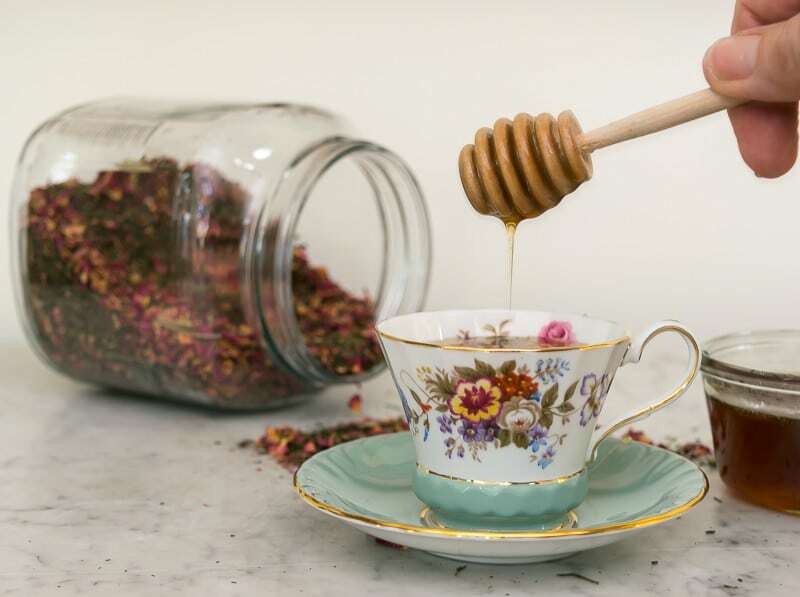 If any of your girl friends are tea drinkers, then I have an idea for you…Rose Petals and Green Tea Gift (or Black Tea) with Rosehips Honey! 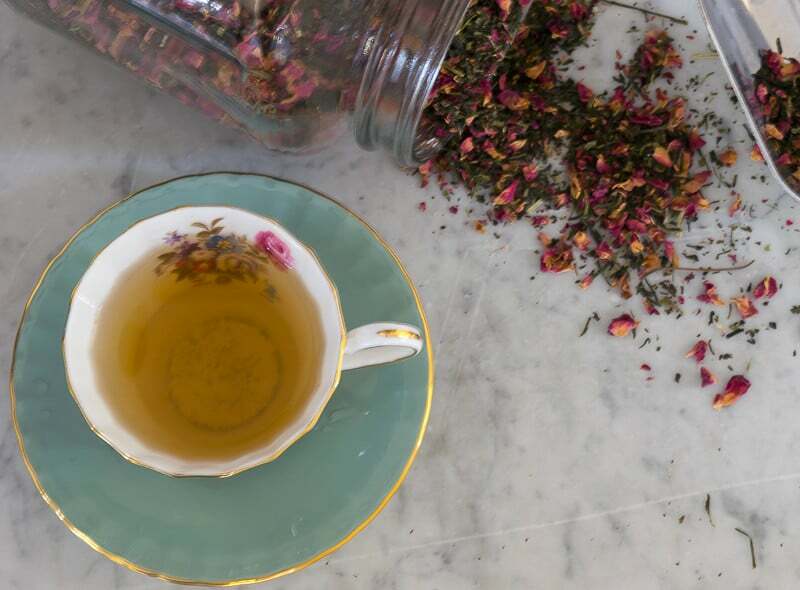 This little rose petals and green tea gift is so easy to put together and can be ‘personalized' with different blends,with or without an added tea cup and/or tea strainer. You can often find tea cups and saucers in your local thrift store, on Etsy or Ebay. In terms of how I made the tea, it was just a matter of tossing the tea with the rose petals. I used a 1:1 ratio, but I don't think there is a specific ‘recipe', per se. Just a matter of taste…add more rose petals for a rosier taste. For what it's worth, it is claimed that rose petals can help with constipation, menstrual cramps as well as help relieve stress and anxiety. I combined the honey and the rose hips (1:1) in a lidded jar and heated the jar on ‘warm' in water in my slow cooker for about 2 days. I kept the lid askew to let some of the heat escape as I didn't want to boil my honey as the boiling would diminish the many healthy benefits of honey. I also added a handful of rose petals to the honey and let it ‘marinate' for a week before I strained the rose petals out. I actually kept it under my kitchen sink…that seems to be a warm spot in my kitchen when the heat is on. You can really detect the lovely rose scent in the honey. As it relates to the rose hips, they are known to improve circulation, digestion and lower cholesterol. If you'd like to do something similar for your gal friends, I've made available sheets of the tags in the Subscriber Benefits Library…you can sign up for access to all the good stuff in the Library here. I'm a green tea gal, but I understand it's an acquired taste. As such, I've also made a sheet of tags for black tea lovers. I printed the tags on cardstock, folded the tag over the top of the bag such that the ingredients part is on the back and punched holes through both the tag and the bag. I then just tied a ribbon through the holes. So, were you familiar with Galentine's Day? Will you do something with your gal pals this year on Galentine's Day? If the idea of a Rose Petals and Green Tea Gift appeals to you, by all means bookmark this page or pin this image for your future reference.